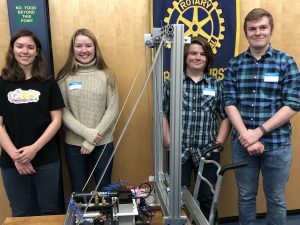 Home » Club News » GHS Robotics Team! Our club is always so pleased to have our local High School students come to speak at one of our Monday noon hour meetings. This past week was no exception. 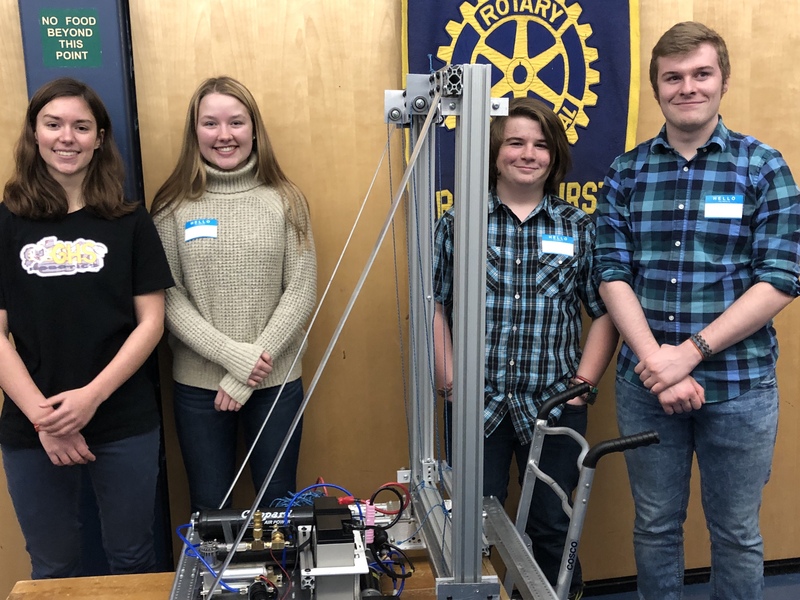 We welcomed four talented exciting students of the Robotics Team from Gravenhurst High School. These students are in their second year designing, building and competing. The first year there were 9 members on the Robotics Team and this year, with enthusiasm building, there are over 20 members involved – an equal number of guys and gals. The team is enthusiastically assisted by Linda Hachmer and Iggi VanKooten. The two competitions that this team would like to attend take place March 1-3 and March 28-30 this year. It is our plan (within our Rotary Club) to assist financially with this Robotics Club. We look forward to hearing more from these students after they have competed; we wish them the best of luck.